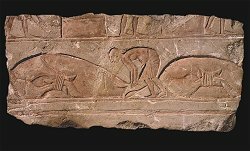 Name for small blocks of sandstone (on average 55 x 25 x 25 cm) used to construct Akhenaten's Aten temples and palaces in Karnak and El-`Amarna. Because they were all the same handy size it was possible to build things quickly. After the death of Akhenaten, his temples were quickly dismantled, and the blocks reused in vast numbers in other constructions. The origin of the term talatat is disputed; it is usually assumed that it derives from the Arabic word for 'three', indicating the width of the stones (three palms) and used by modern Egyptian workers to refer to the blocks.